Stills showing the Low-Density Supersonic Decelerator test vehicle's huge parachute at or near full inflation (left) and after a rip developed (right) during a June 8, 2015 test flight. A gigantic supersonic parachute that NASA is developing to help land heavy payloads on Mars was torn apart during yesterday's "flying saucer" test flight over Hawaii, agency officials said. The 100-foot-wide (30 meters) parachute — the biggest such chute ever deployed — unfurled well and apparently inflated fully, or nearly fully, Monday (June 8) before being ruptured by the fast-rushing air during the second flight test of NASA's Low-Density Supersonic Decelerator (LDSD) project. "On this project, we're pushing the limits of our technologies, our engineering and our understanding of aerodynamic decelerators," Clark added. "This year, the physics of supersonic parachutes pushed back on us." The LDSD program is developing technology to help get human habitat modules and other heavy gear down softly on the surface of Mars. The big supersonic chute — which is twice as wide as the parachute that slowed the descent of NASA's Curiosity rover through the Martian atmosphere in August 2012 — is one of two core components of LDSD tech. The other is a "supersonic inflatable aerodynamic decelerator" (SIAD), a saucerlike piece of equipment designed to fit around the rim of an atmospheric entry vehicle, increasing its surface area (and thus its drag). NASA is developing two SIAD versions. One measures 20 feet (6 meters) wide after inflation, while the other is 28 feet (8.5 m) across. Monday's flight involved the big chute and the 20-foot SIAD, both of which were packed onto a 7,000-lb. (3,175 kilograms) test vehicle. A huge balloon lifted off from the Pacific Missile Range Facility on the Hawaiian island of Kauai, lofting the LDSD craft up to an altitude of 120,000 feet (36,580 m). The SIAD deployed as planned at Mach 3, and then the test vehicle's ballute — a balloon-parachute hybrid that pulls out the supersonic chute — deployed shortly thereafter, said LDSD project manager Mark Adler, also of JPL. Everything worked pretty much perfectly up to this point, Adler said. And the supersonic chute performed well initially, appearing to reach full inflation before the tear developed, he added. "A preliminary look at our load data indicates that the parachute developed full, or nearly full, drag up to the point where that damage can be observed," Clark said. Monday's trial marked the second flight test for LDSD technology. The first, which occurred in June 2014 from the Pacific Missile Range Facility, proceeded similarly: The SIAD and ballute (a portmanteau of "balloon" and "parachute") worked well, but the parachute was torn apart shortly after deployment. So the LDSD team modified the parachute, developing a stronger and more robust version for the second test. While this one failed as well on Monday, team members saw signs of improvement. Last year, "we saw the parachute be damaged very, very early in the inflation process," Clark said. "This year, with the low-resolution data that we have presently, it looks like the parachute remained largely intact, if not entirely intact, up to the point of full inflation. And we also saw more drag being generated out of this parachute this year than we did last year. So, those are both pluses." 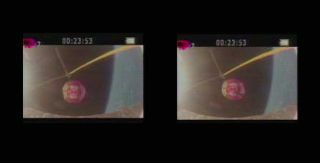 Both test flights were broadly successful, Clark and Adler said, stressing that the data gathered will help advance and mature crucial Mars-landing technology. "We very much want to have these failures occur here in our testing on Earth, rather than at Mars," Adler said. "So it's a success in that we are able to understand and learn more about the parachute so that we can get confidence, and have highly reliable parachutes for when we have a large mission going to Mars." Clark and colleagues will keep working on the parachute, aiming to test another version from Hawaii next year. The SIAD and ballute, meanwhile, appear ready for use on planetary missions right now, after two successful test runs. NASA has budgeted $230 million for the LDSD project, which calls for three flight tests. But certifying the supersonic chute will require two successful test flights, so more money will likely be needed for a fourth balloon-aided mission down the road, Adler said. "We'll need to do some [cost] estimates for what a fourth flight would be, at [NASA] headquarters' request," he said.